Physicists at the U.S. Department of Energy's (DOE) Princeton Plasma Physics Laboratory (PPPL) have successfully tested a new device that will lead to a better understanding of the interactions between ultrahot plasma contained within fusion facilities and the materials inside those facilities. The measurement tool, known as the Materials Analysis Particle Probe (MAPP), was built by a consortium that includes Princeton University and the University of Illinois at Urbana-Champaign (U. of I.). The device lets scientists test the chemical make-up of the surface of materials exposed to plasma, while keeping the materials in a vacuum. The research was published in the July issue of Review of Scientific Instruments, and was funded by the DOE Office of Science (Fusion Energy Sciences) and the Francisco José de Caldas Fellowship Program. MAPP's leading developer is Professor Jean Paul Allain, now at the U. of I., who began the project in 2011. Collaborators at PPPL include physicists Robert Kaita, Charles Skinner, and Bruce Koel. 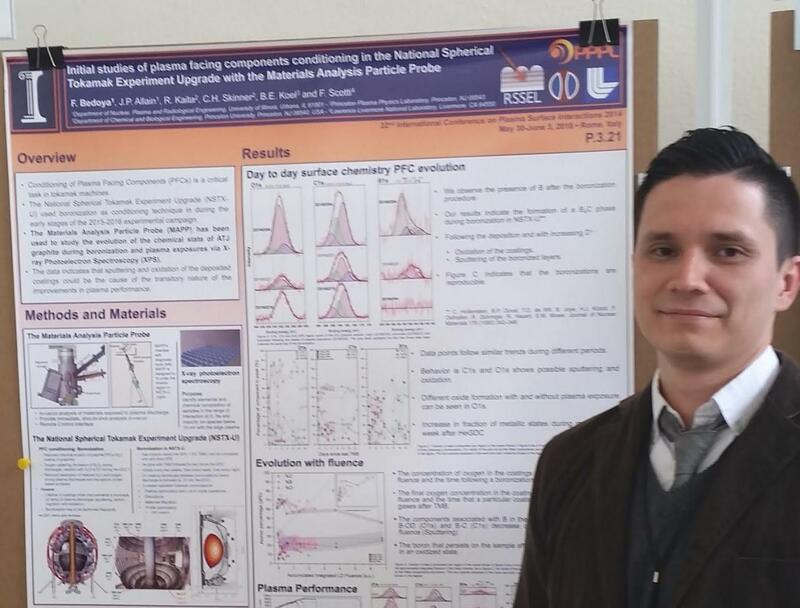 "Using MAPP, we are seeing for the first time the evolution of the materials when they interact with the plasma, and how the conditioning and other procedures modify the chemistry of the materials," said lead author Felipe Bedoya, a graduate student in the Department of Nuclear, Plasma and Radiological Engineering at the U. of I. Bedoya spent a semester at PPPL investigating the relationship between the conditioning of plasma-facing components (PFCs) and the behavior of plasma in the National Spherical Torus Experiment-Upgrade (NSTX-U), the nation's newest fusion device and the flagship fusion facility at PPPL. The interactions between the plasma and the inner walls of the tokamak are crucially important to the production of fusion energy because they profoundly affect the condition of the plasma. If hot hydrogen ions in the plasma touch the walls, the ions are absorbed and cool down. And if the cool hydrogen re-enters the plasma, it lowers the temperature of the plasma's edge and fusion reactions within the plasma occur less often. In addition, the interior of a tokamak can be eroded by the bombardment of the plasma ions. The amount of plasma-wall interactions can also determine how long a tokamak's plasma-facing components can last before being replaced. Understanding the behavior of materials when exposed to plasma is therefore critical for the design of future fusion machines. Before MAPP, scientists had to wait for the completion of a long series of fusion experiments before analyzing materials within a tokamak. That kept researchers from confidently correlating fusion experiments their effect on the materials. And because samples of the material had to be exposed to air when they were brought to a laboratory, scientists couldn't be sure that the chemistry of the samples had not changed. MAPP enables material samples to be measured under vacuum conditions after each experiment. "People used to wait until the end of an experiment campaign to take out a tile, bring it to a lab, and examine it," said Bedoya. "What we're doing right now is bringing the lab to the machine." MAPP has been in operation on the NSTX-U for the last 10 months. While using MAPP, researchers expose a set of material samples conditioned with boron to the NSTX-U plasma and retract the samples into a vacuum chamber without any exposure to air. They then use a technique called "X-ray photoelectron spectroscopy" to strike the samples with X-rays and study the electrons the process emits. The emissions provide information about the surface chemistry of the samples, revealing how the boron coating changes when exposed to the plasma. In the paper, the authors report that they successfully tested a method to analyze data produced by MAPP. They used a sophisticated computer program called CasaXPS to obtain the proper interpretation. Results appear to have matched both controlled laboratory experiments and computer simulations, suggesting that the technique's analysis is correct. "Many people have seen a strong correlation between the conditioning of the plasma-facing components and the performance of the plasma," Bedoya said. "So if you can diagnose how the conditioning changes, you can do it better and better each time and ultimately figure out the optimum conditioning." 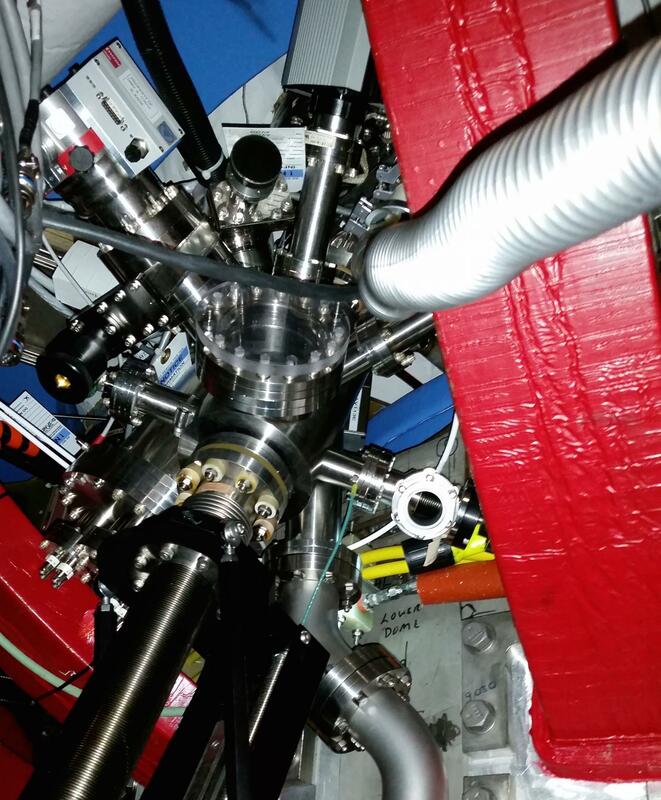 Scientists believe that MAPP will become an integral part of plasma physics research. "MAPP is a step towards uncovering the mysteries of what's happening at tokamak walls, shot by shot, as the wall changes the plasma's conditions," said Charles Skinner, PPPL physicist and co-author of the paper. "Using this device could help us see exactly what's going on at the wall, and how that correlates or even explains what's going on with the plasma."